Our cheese enchilada recipe is probably the easiest of all the enchiladas to make, mainly because you don’t have to cook the filling. The enchilada sauce you use is very important to the success of your dish. In fact it can make or break the dish so to speak. Try my homemade enchilada sauce recipe that’s very easy to make. Visit your favorite Mexican restaurant and pick up a quart or two of their enchilada sauce. Try Trader Joe’s bottled Enchilada sauce. I know you will be impressed. In my opinion, it’s the best bottled enchilada sauce sold in a grocery store. 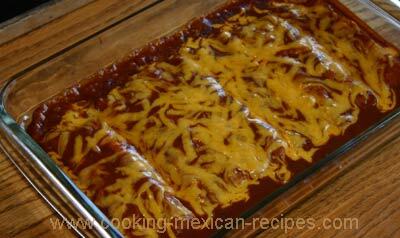 If you are looking for beef enchiladas click here. Heat the vegetable oil in a frying pan on medium heat. You will need some tongs and a plate or tray to assemble your enchiladas. Using tongs, dip two corn tortillas at a time into the hot oil. When the tortillas start to bubble, lift and dip them into the oil 3 times fairly quickly. The goal here is to make the tortillas soft. If the tortillas are left in the oil too long they will get hard and be difficult to roll. If that happens just toss them out and start over. The other option is to go ahead and keep cooking them in the oil until they become hard. These can be used as tostada shells if you like. Okay, back to dipping the tortillas 3 quick times in the oil. Once you do this, dip the tortillas into hot enchilada sauce to coat. Now put the tortillas on a plate to cool one minute. Add a handful of the grated cheese and sprinkle some onion down the center of one tortilla and roll it. Do this by grabbing one end of the tortilla and bringing it 3/4 of the way over to the other end. Tuck and roll the tortilla. Pick up the enchilada with your fore fingers on the bottom where the seam is. Let your pinky fingers cover the ends of the enchilada to keep the cheese from falling out while you move it to an oven proof dish. With a little practice you will be a pro in no time at this. Using a ladle, pour hot enchilada sauce over the top and let plenty of sauce run down the sides. Remember, the sauce is what makes it! Sprinkle more cheese and onion on top in the desired amount. Now didn’t I tell you this was easy? Place your enchiladas in the oven. Heat the enchiladas until they look somewhat flat and the sauce is bubbling. This will probably take 15 minutes or more. Remember, you want to make sure the cheese inside the enchilada is melted. Notice the bubbles around the edge? This cheese enchilada recipe has got to be hot to be good. Refried beans and rice make a perfect compliment to this enchilada recipe! Don’t forget to add some sour cream and guacamole too. Prepare my apple cider vinegar recipe and place a handful of salad right on top or next to the hot-out-of-the-oven cheese enchilada. Then sprinkle the dressing on your salad. This combination tastes absolutely wonderful together. If you ever have any questions about any of my recipes, don’t hesitate to email me. I love to answer questions. This dish is very similar in size to the one I use in the video to place one enchilada in. Once you’ve begun using this Au Gratin, you’ll be pleasantly surprised to learn how very versatile it is. Not only can you bake in it, you can also use it for serving (the white porcelain blends in well with your other dishes). And for cleaning, it goes right into your dishwasher. 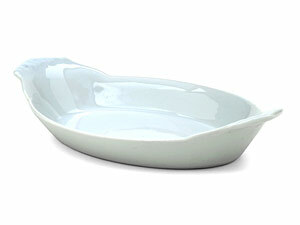 The oval dish measures 10-in., great for vegetables, rice, fruit desserts and roasted vegetables. With all the high-tech equipment in the marketplace these days, it’s easy to overlook something that’s been around for decades (actually since 1919)–Pyrex. 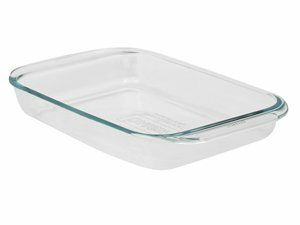 Originally called “fire glass” because it could withstand heat, Pyrex has proven to be an excellent material for bakeware–especially for fruit desserts like cobblers and crisps, quick breads and bar cookies. This 3-quart oblong pan measures 13″ by 9″ by 2″. Although not technically nonstick, few things stick to Pyrex and those that do clean away quickly and easily after the pan has been soaked in hot water.